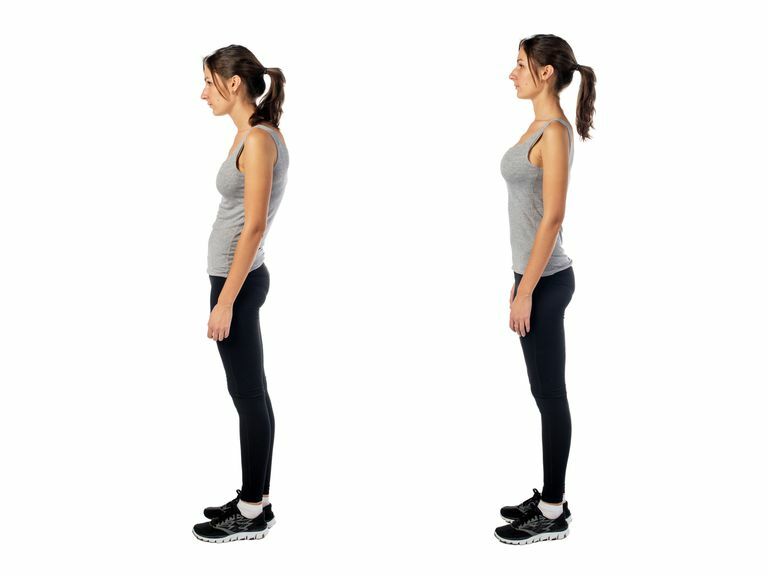 Understanding posture, including swayback posture, is a bit like following along with the song "Dem Bones." The lyrics talk about how the parts of the skeleton connect together to give us our frame. When it comes to swayback posture (as well as other types of "deviations" from the "ideal,") the first bone to understand is the pelvis. Large and centrally located, the pelvis receives the low spine from above and the legs from below. In this way, it coordinates movements of the head, shoulders, and trunk, with those from the feet, legs , and thighs. A neutral pelvis (the ideal position) generally supports a mild curve (called a normal lordosis) in the low back. This small degree of arch helps the body to balance all the skeletal parts as they work together to support and move your body weight. But when you have a postural deformity, one or more bones may "deviate" from its ideal position. This deviation may lead to muscle strain, ligament sprain, and/or pain. It may also cause your spine to adjust its position in one more area. This is to make up for any pain or loss of balance created by the original deviation. To define and work with postural deformities (aka the "deviations" mentioned above) doctors and physical therapists use exact measurements. Let's try to understand the elements of swayback from their perspective as best as we can. The measurements the experts use get more complicated than this, but the meaning of "neutral pelvis" is almost that simple. Neutral pelvis is a position of balance the entire body uses to help keep you upright, moving and pain-free. Another thing you can see in a swayback posture (as long as you're viewing it from the side,) is a backward movement of the entire thoracic spine. This area of the spine tends to elongate, as well. In front, the chest tends to sink. To recap, then, in a swayback, the thoracic spine moves backward and also rounds over into a kyphosis, while the pelvis is tilted forward, resulting in an exaggeration of the normal lumbar lordosis. As with any postural deviation, swayback is sometimes associated with strength imbalances between muscle groups that move the hips, spine, and pelvis, and of course, hold you upright against the downward pull of gravity. In other words, weak hip flexors (located at the front of your hip) and overly strong or tense hip extensors (the hamstrings, at the back of your hip and leg) may be at the root of this problem. Tight upper abdominals, weak lower abdominals and weak mid-back muscles may also contribute to swayback. A corrective exercise program, such as one you'd likely get by seeing a physical therapist for your swayback, may help address some or all of these underlying muscle imbalances. Because weight in the abdominal region pulls the pelvis forward, pregnant women and extremely obese people who carry their weight in the abdominal area may be at a higher risk for swayback than many. Teenagers with "attitude" may express that attitude through a swayback posture. Treatment for swayback should be based on an accurate evaluation performed by a licensed health provider trained in postural assessment. Usually, this is a physical therapist. It might also be an athletic trainer, personal trainer or holistic provider with advanced education in this specialized area. Ask your doctor for a referral and for the okay to participate in a corrective exercise program for your swayback. Your therapy may consist of posture exercises, massage therapy, biomechanics training and/or weight control. Also, maintaining a strong core is vital to a healthy upright posture. Strengthening your core posture muscles will likely provide a foundation for the other exercises you do to address the swayback directly. Swayback is related to lordosis, or curvature of the low back area. But the exact meaning of the word swayback may differ according to whom you ask. Some experts see swayback as excessive lordosis (hyperlordosis). Kendall, FP, Kendall McCreary, E, Provance, PG. Muscles: Testing and function with Posture and Pain. 4th ed. Williams & Wilkins. 1993. Baltimore. Magee, D. Orthopedic Physical Assessment Enhanced Edition 4th ed. Saunders Elsevier. 2006. St. Louis.